This is a birthday card for a friend who receives a squirrely card from us each year while we all go camping together. I based this card’s design on Unscripted Sketches Summer Flashback Sketch #69. 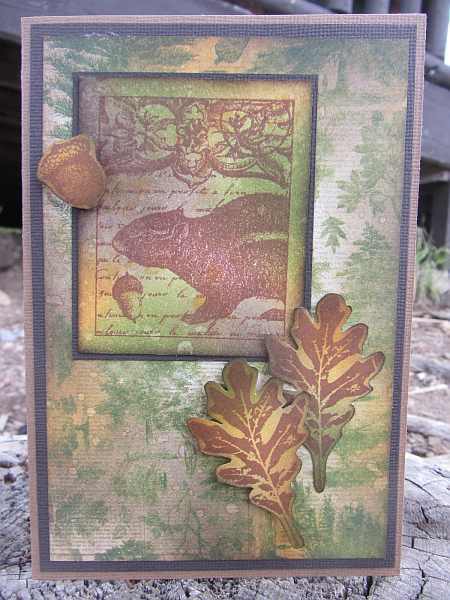 I distressed the patterned paper with Ranger Distress Inks and spattered with water to create a background that matched the stamped leaves and acorns, which I distressed with the same ink colors. I popped up the acorn and one of the oak leaves with dimensional adhesive for a little 3-D effect. I created this card outside on a picnic table up in the mountains while camping. I had some chipmunk friends nearby, just to set the mood! Thanks for visiting today and Happy Birthday, Allyn! PostScript: This card was selected as one of the Top Three cards created and posted using Unscripted Sketches Summer Flashback Sketch #69! Hurray! This entry was posted on Friday, August 30th, 2013 at 12:07 am	and tagged with cardmaking, distress techniques, fauna, Impression Obsession, inkadinkado, Magenta stamps, stamping and posted in Autumn, Birthday Card, Distress Techniques, Unscripted Sketches. You can follow any responses to this entry through the RSS 2.0 feed.